There's no shortage of weather apps for iOS or Android. Seriously, do a quick search and behold the lengthy list of results that you'll end up with. So if that's the case, why are we highlighting yet another one that has just joined the party? Well, because Grumpy Weather is quite different from the rest. There aren't pretty pictures of sunny landscapes in Grumpy Weather. There aren't any fluffy clouds either. Instead, the weather is delivered to you in the form of a short comment – a grumpy one, as you can probably tell. It's kind of like having Grumpy Cat as your personal weather man cat. As a matter of fact, the feline is among the various creatures that will grumpify your home screen with their melancholic expressions. So yeah, the app is kind of fun in its own way and should be given a chance. But on the downside, there isn't a whole lot that Grumpy Weather can actually give you in terms of weather information. It can provide a basic 3-day weather forecast, in either metric or imperial units, and that's about it. Still, if you find that enough, then give Grumpy Weather a shot. It is available as an app for iOS and as a widget for Android. Both are free, but each of the cartoony creatures available for download will set you back a dollar. OMG it fits me perfectly. SO downloading this. Yāy~! Depends in what family you live in! Ha, don't you remember the article about the prostitute app? Or thieves using a stolen phone to film themselves f*cking? I like it but it's not that accurate. Said it was raining out even though the rain was no where near me. Grumpy Cat approves of it though. How little it takes to amuse people. Now if this was a widget that, when pressed, would vocally rant about the weather with enough detail that you could get a sense of what the weather picture was now and for the next 12 hours (with a gravely, grumpy voice stringing together multiple sentences that would vary over the course of time), maybe I'd consider it. 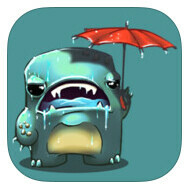 Brian the deadone - new character in Grumpy Weather has just arrived to the app! check it out.